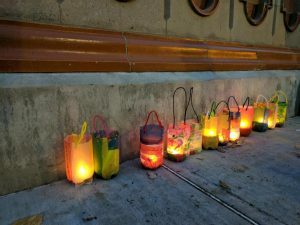 On Sunday, November 5, the Washington Park Conservancy and the City of Albany will host the second annual Albany Lantern Parade in Washington Park. We invite you to bring friends and family and join neighbors from 4:30-6:00pm for a sunset parade of home-made lanterns around Washington Park Lake as we welcome Eastern Standard Time. This family-friendly event is free and all are welcome! 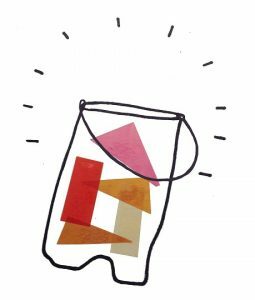 In the weeks before the event, free lantern-making workshops will be held at libraries and other venues around the city. Check our Facebook page for a complete schedule of workshops — or make some lanterns at home. We’ll meet at the Lake House on Sunday, November 5 at 4:30 to bring arts, community and warmth to the autumn evening. Many thanks to the City of Albany and the Albany Public Library for their partnership. Lanterns lined up along the Lake House before last year’s Lantern Parade.